You've probably heard that tummy time is good for building muscle strength--but there's much more! Lying on the belly is an important position for babies that allows normal, natural development to occur. Each of the "milestones" has its roots in tummy time because the position activates many reflexes. Allows important reflexes (needed for milestones) to trigger. While on the back, the torso is stable on the floor while the limbs move freely in the air. While on the tummy, the limbs stabilize on the floor and the torso can move: this is how moving from one place to the next happens! Each stage provides the skills that will be needed for the next milestone. becomes standing, sidestepping ("cruising"), and walking! Above: This baby is about to learn how to sit independently! Sitting requires a shift of weight to one side and pushing up with the hands. After months of preparation in tummy time, he is starting to rotate and push all the way up into sitting! Once babies have built such a solid foundation on their tummies, they can reach out into space and explore the environment. Because they have pushed into the earth to bring themselves up higher, they have measured their distance from the floor and know their own abilities ; and so develop a feeling of safety in which falling is not scary. Imagine nap time (for YOU!) ...in a sunny spot or in your favorite position. What is it that makes it so comfortable? Recall the feeling of it: of releasing comfortably in gravity, or "yielding." 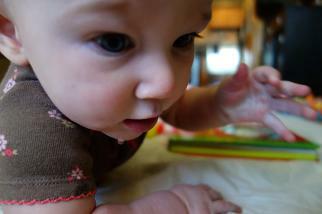 Ideally, Tummy Time is about comfort and yielding into gravity (there's actually a reflex for this!). Within this yielding, there's contact. With what? With a surface; and from that feedback, with ourselves. From this yield and contact can grow a gentle push in the arms. In this relationship with gravity, reflexes kick off. Perhaps Baby hears something and is motivated to see it--perhaps it's you! Now we have: yield + contact + push + reflexes + sensory information + motivation + relationship. All this = the head rising! And eventually the chest. Through this process, babies find their structure--their skeletal support that holds them up. Muscle strength gets built in the process, and each factor builds on all the others. The approach you'll find on this site is geared toward function and comfort, not just exercise! Above: Notice her eye-hand-mouth coordination! Tummy time has allowed her to build up support, strength, and coordination to belly crawl, taking her toward what she desires. "There was a trend through the 1980’s and early 90’s to avoid stomach lying as much as possible. Genuine fears about protecting the child’s airway led to this well-meaning but ultimately misguided conservatism. The prevailing feeling was that children ultimately roll over and crawl, so we will protect them until they figure out how to do those actions safely on their own. Added to the advent of car-seats and other important safety measures, we saw a generation of kids who were essentially told to figure it out on their own. Many did, but we did see an increase in delayed walking and in some cases the loss of important milestones, like rolling, arm push up and other actions which help develop normal patterns of gait and balance. Although it is still early to tell, we seem to be seeing an increase in early joint problems in this protected generation." "We seem to have finally figured out that prone lying, or Tummy Time, is safe and vitally important to the development of upright function. It promotes the awareness of weight bearing and transfer. It leads directly to experimentation with arm and leg movements which facilitate crawl. And ultimately, it is from the prone position that humans learn to lift up and become upright walkers." As for the all-important hip joint, which seems to govern all of propulsion, Tummy Time provides the ground and reactive forces necessary to start the process of realignment of the joint. The baby feels the ground below the pelvis and reacts with muscular contraction. The muscle function starts to reshape the hips. As the hips reshape, pulled inward and forward by the muscle function, they become stronger and better positioned to lift the body and to start forward propulsion. And ultimately, these functional changes lead to increased strength and balance which lift the child upward into stance and walking." 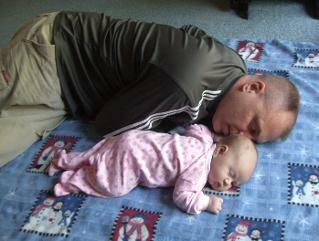 For more about the importance of Tummy Time for hip development, see his article.